The bank was established on March 29, 1910, at a meeting held in the St. Casimir School in Hammond, as The First Polish Building Loan & Savings Association. This partnership, created by and for the area's large Polish community, was a means to safely save money and lend it to others primarily for the purpose of building or buying homes. Clement B. Knapp, Sr. began his career with the bank serving as an officer and Director for the bank beginning on September 26, 1930. This early leadership helped to push the bank through the Great Depression of the early 1930s and emerge as a strong financial institution. Then, on July 1, 1937, the bank changed its name to American Savings and Loan Association and its deposits became federally insured up to $5000. CB Knapp, Sr. eventually assumed leadership of the bank as its President in 1949 and was responsible for helping to grow and build the bank until his retirement in December of 1978. Fortunately, his 48-year career with the bank ended with his son, Clement B. "Skip" Knapp, Jr., succeeding him as bank President. Sadly, Clement B. Knapp, Sr. passed away on July 18, 1980. Nearly 50 years after the first name change, on March 19, 1987, the bank converted to a federally chartered institution and changed its name again to American Savings, FSB. Much as it had under his father, the bank continued to grow and expand under the leadership of Clement B. "Skip" Knapp, Jr. until his subsequent retirement in December of 2008. Like his father before him, Clement B. "Skip" Knapp, Jr. was fortunate to be able to impart his 30 years of wisdom to his son, Michael J. Mellon, and make Mr. Mellon the family's third generation President. The bank continues under Mr. Mellon's leadership today. In 2015, Mr. Mellon led the bank through another transformation that saw the bank change its charter to a state of Indiana commercial bank including another name change to American Community Bank of Indiana. 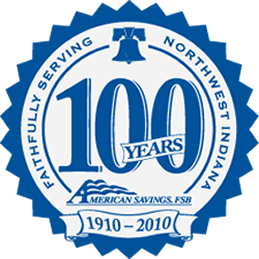 American Community Bank of Indiana serves the complete financial needs of families and local businesses in its primary market area, Lake County, Indiana. Deposits are insured up to applicable limits by the Federal Deposit Insurance Corporation (FDIC). American Community Bank of Indiana seeks to provide, safely and profitably, financial services to families and local businesses. Its business involves attracting deposits from the general public and using such deposits to originate one- to four-family residential mortgages and, to a lesser extent, multi-family, non-residential real estate, land, commercial business and consumer loans in its primary market area. The bank also invests in mortgage backed securities, investment securities consisting primarily of U.S. government obligations and various types of short-term liquid assets.